In addition to details below, the symbolic of the cover emphasizes how much any effort of the man to become better, bring really positive in his life, only when he is turned over to him sanctified by God. The intellectual effort is certainly one hundred percent essential, but vain, if it does not lead to the mental findings of our impotence to obtain spontaneous reactions identical to those to which our intellect gives reason, in comparison to the Word of God. When, overcame by this observation, we turn humbly to God and let us give to him the corresponding blackness of our heart, It returns it to us in his time in an unforeseen way, returning to us victorious of a victory that we do not even imagine! The dead branches, which encumbered our life, stray from our way, allowing us a life in abundance of heart, peaceful and filled with a new joy. The Dove of the Holy Spirit of God then comes gradually to fill all our heart with a new Love in conformity with the Word of God, because he puts his Laws in our hearts, and enters them in our intelligence. Click on the numbers to read the comments. Click on the numbers to read the comments. Perhaps we feel the Spirit of God in certain particular circumstances in which we would like to live daily, but the world, which surrounds us, always comes in obstacle, like carrier of a curse. We have then the choice indefatigably to fight these circumstances or even the authors of these circumstances to make a world to our dimension, or to carry out humbly the good combat against the dominations in the celestial places, recognizing our impotence and the lack of Love of our hearts. Our aim then becomes not to give to the enemy of our soul, only one “iota” of happiness that God wants to give us and has acquired us dearly in Croix, even if we must for that, we repentance of some of our errors. At the previous moment the rejection of the sin built in our carnal dimension, we can have the impression that we would prefer to give us death rather than to abstain us of this share of “ourselves”. This is why the kingdom of heaven belongs to the violent ones, and not to undecided, who would like to belong to God without having to say not to the enemy of our souls. In order to give not again him reason only one iota, this essential violence then materializes by a savage will to say not to the trap into which we fell, for certain so often, even if for others the error were elsewhere. Any human being, other that Jesus is born from the carnal dimension that forms our psychology since the maternal womb. This is why; any human must work to its sanctification already on this earth, to the risk for him never accedes near God. The first victory that God wants to give us is the baptism in the Holy Spirit. This one is similar at the arrival of a first electric bulb installed near a fuse board, offered free by Jesus in our residence. The light is there, and it does not remain us any more that to light gradually each one of our dark corners, of which some are true wall cupboards and even black holes. Without its external electric current, nothing is possible, this is why any effort of the man to becoming better by itself is vain and leads to other traps if the Dove of the Holy Spirit of God does not offer it to us. In His Love, God wants to give us the life in abundance, reason why each time we eradicate with his assistance the roots of our sin, He turns over us the purified and sanctified corresponding share of life. Any sin, any carnal dimension to which we are likely to succumb takes us away from God and his Glory. This is why, when we let us convince by the Holy Spirit, our Friend, to exceed by the faith our carnal limits and to say no to the sin in the real dimension that created our spirit in our brain, God turns over us this share of LIFE in a dimension in conformity with his Law for our greater happiness. It is at this moment, that the word of God fulfilled it in us, because, if God had already put its laws in our heart by the baptism of the Holy Spirit, as it says in Hebrews 10-16, God writes then, engraves them in our spirit. Our remained carnal spirit in our brain, which until then silenced the Holy Spirit in our hearts, at key moments in our life is like "crushed" and rewritten in the logic with the Spirit of God and Love of our neighbor. The spirit of our brain, thus being became in accordance with the Holy Spirit in our hearts, becomes also complies with our consciousness written by our Creator in our genes. In front of a new adversity, even immediate, we find ourselves suddenly quiet and confident, but amazed, because capable of reactions according to the word of God, contrary to what we were living previously, although we already wanted in our moments of communion with God. 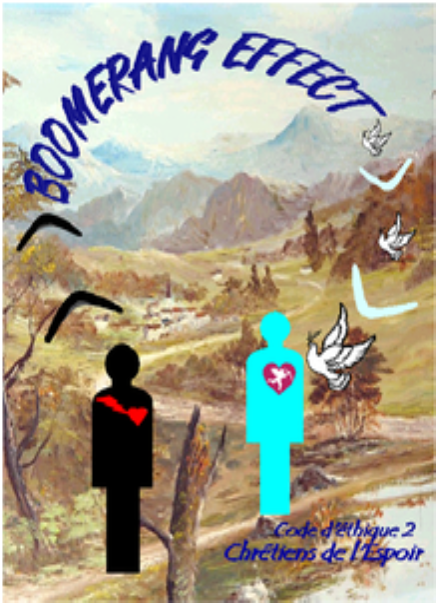 The true Boomerang Effect of God registered in confidence in this God of Love, seen through an heart renewed and released until taking on almost the totality of the Heart of God. The tribulations hitherto destructive, converge towards an unsuspected progression but quite real of a growing plenitude. Our heart is less and less tormented, and we see the Love of god growing in us. The pitfalls of life are avoided because they no longer come from within, as previously, when the enemy expressed his rights on us. To our dismay, we were remaining then, mired in dead branches, but like these obstacles are now external to us, we avoid them naturally. Joy is thus in a meeting! Jesus has everything achieved for us and if we follow him in this renewal of our soul and our spirit, we understand then easily, why it is written: ONLY FAITH IS PLEASANT TO GOD.